Kelsh Wilson recently completed a multi-part marketing project for The Independence School in Newark, Delaware: a new suite of admissions publications, page designs and marketing content for a new website, a logo and brochure to support the Summer Program at Independence, and a Message Guide to help bring consistency and impact to the school's communications going forward. As the project wrapped up, we spoke with Claire Brechter, Director of Enrollment and Marketing at Independence, about her experience of partnering with KWD. What’s been the reaction on campus to the new admissions viewbook and supporting brochures? We’ve just begun sharing the pieces, but the reaction we’ve heard so far has been very positive. People are saying “They really get us!” I think we’ve found a richer way to capture the feel of the Independence experience. What was the marketing challenge that originally led you to contact Kelsh Wilson? When we started looking for a new creative partner, we were motivated by the feeling that we weren’t messaging ourselves consistently and well. We wanted fresh eyes to take a look and help us explain who we are. We had already started down the path of developing a new website and we were struggling a bit coming to consensus about both the design and language for the new site. We invited KWD into the website process since it is essential that the web and print presence need to be closely aligned. Initially your team seemed reluctant when we spoke about the need for focus groups research. Why was that? True. Over the course of the past six to eight years, we had engaged with some different consultants whose work had involved focus groups or interviews of various kinds, and we had done a few surveys too. As a result, we really didn’t have the appetite for more research. What persuaded you to move forward with the discovery phase KWD recommended? Kelsh Wilson scoped the work in a very reasonable way and approached it with a focused and practical goal: to gather messaging and content ideas for the specific set of new communications projects we needed. This was not just re-asking the same questions we’d already answered. The process turned out to be extremely productive. The stories you uncovered led us straight down the path to the examples we featured in the print work—the supporting evidence that brought more impact to our presentation. How did Kelsh Wilson’s work on your message prove useful? Over the years, our school had evolved from offering a very strong experience in the foundational academic skills to offering that experience plus much more—things like project-based learning and STEM-focused programs. In the process, I think we lost our way in how to tell our story. Our work with Kelsh Wilson brought us solidly back to our roots. As programs change, you need to find new ways to talk about them, and I believe we’ve done that. Our core hasn't changed but we have adopted new approaches—and now we can talk about both. Has the Message Guide been a success? We’ve talked about the product of our work. Can you comment on the process? I felt very well supported and responded to at every step—my experiences with other firms have not always been positive. We all wear many hats here, so we need the right structure and support to make a project like this successful. Kudos to Mindy Wissmann for her great work in coordinating the project and her responsiveness. We’re obviously pleased with the work—we’re coming back for more! 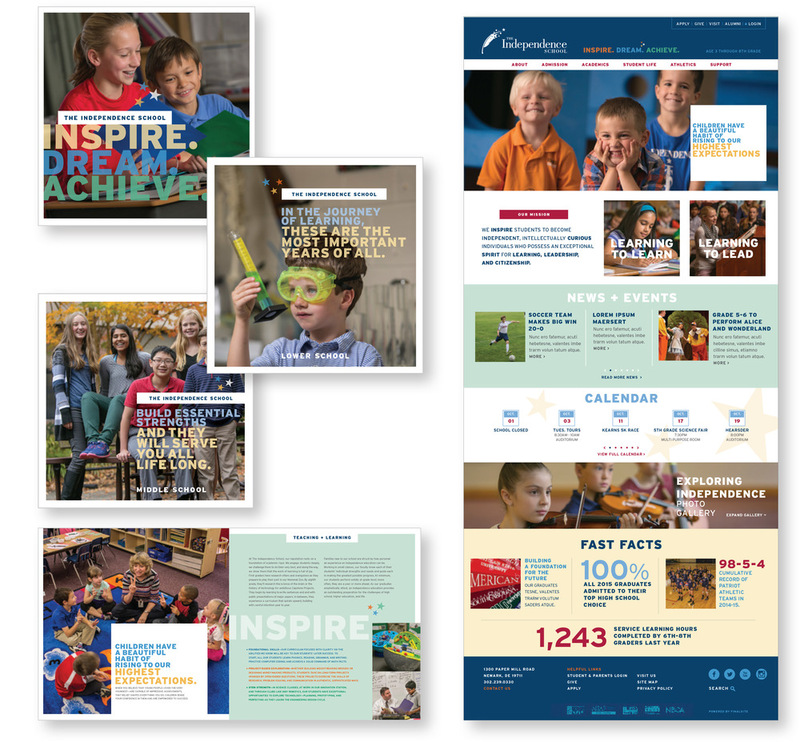 Click here to view more of our work for The Independence School.